But who can understand the Bible? I certainly never had understood it. And even if one does, can one believe the Bible? Does it speak with any authority? That question puzzled me and is the mystery to be cleared up in this volume. How I came to understand began at age 34, in the year of 1926. But it only began there. The final crystal-clear reason that impelled me to write this book did not fully reveal itself to my mind until December of 1984. It was a mind-boggling realization — a pivotal truth — that will be made clear in this book. These intellectual thinkers had become aware of the increasing knowledge about the universe. They could not square this expanding knowledge with the religious teaching of their time. My researches into the thinking of the founders of the evolutionary theory recalled to mind what I then read in the eighth chapter of the Psalms — how King David, a monarch of an ancient nation, looked at the stars in the sky, noted the expansion of the vast universe and began to think. He wondered in his mind, what was he? What was man — in the vast expansion of the endless universe? I found that this ancient king had never received the full answer to the questions that plagued his mind. But I was later to discover, in my same research, how the final answer was revealed to the apostle Paul and explained in the second chapter of the book of Hebrews. I was determined to find absolute proof of the existence of God and of the authority of the Bible, or to reject both. Most people, I realized, accept or reject a belief on careless assumption due to whatever they have heard, been taught, or assumed without proof. I wanted to understand. And I wanted to be sure on positive proof, not on careless assumption or wishful thinking. No longer was the existence of God taken carelessly for granted because I had always heard it or been taught it. I found absolute and positive proof of the existence of the Supreme Creator God and also of the absolute authority of the Holy Bible as the Word of God — the revealed message and knowledge of God for mankind. I learned that the Bible is like a jigsaw puzzle — thousands of pieces that need putting together — and the pieces will fit together in only one way. Then the picture becomes crystal clear to the one willing to believe what God our Creator says. 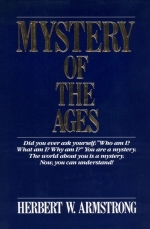 This world's humanity has been blinded to who, what and why man is — how man appeared on earth. Man has been mystified by his inability to solve his problems, or find answers to the perplexing questions of mankind and the world he inhabits. I have often said it is much more difficult to unlearn an erroneous supposed truth than it is to learn a new truth. Even in these past 58 years I had not fully and clearly realized the significance of the fact revealed in Genesis 3:22-24 — that, in fact, God had closed the Holy Spirit and eternal life to mankind in general until the removal of Satan at the Second Coming of Jesus Christ. Traditional Christian teaching had always assumed there is a contest between God and Satan — that God has been trying desperately to "get the world saved," but in this great controversy Satan has been winning. In other words, God had sent Jesus Christ at his First Coming to try to win this ongoing war against Satan. Traditional Christianity has taught that "whosoever will may come" and be "saved" through Jesus. And now, in my 93rd year, I have been led to write this book before this event-packed life ends, to share with as many as care to know, the answers that the great supreme mind of God reveals in his Word — if one is only willing to understand that Word.